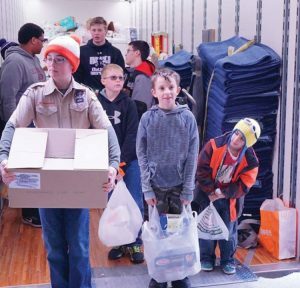 For over 100 years, the Boy Scouts of America has been an active participant is helping communities. In 1917-1918 Scouts collected nutshells and peach pits that were eventually used in the production of gas masks. In the 1930’s Scouts collected clothing, household furnishing and food as aid to families during the depression. And in the 1940’s it was aluminum as part of the war effort. Whatever the need, Boy Scouts of America is there. In March, Twin Valley Council Scouts will have the opportunity to once again help our communities by participating in Scouting for Food. Twin Valley Council 2019 Scouting for Food Campaign will begin by distributing post-it notes to homes in your community. Distribution of notices will be March 9th. Bag pick up will be the following weekend on March 16th. We ask that all units coordinate with their families to make this project a huge success. Thank you in advance for helping with this incredible project. Together we do make a difference.